Allow the puff pastry to warm up a bit so that you can easily unfold it without tearing it. 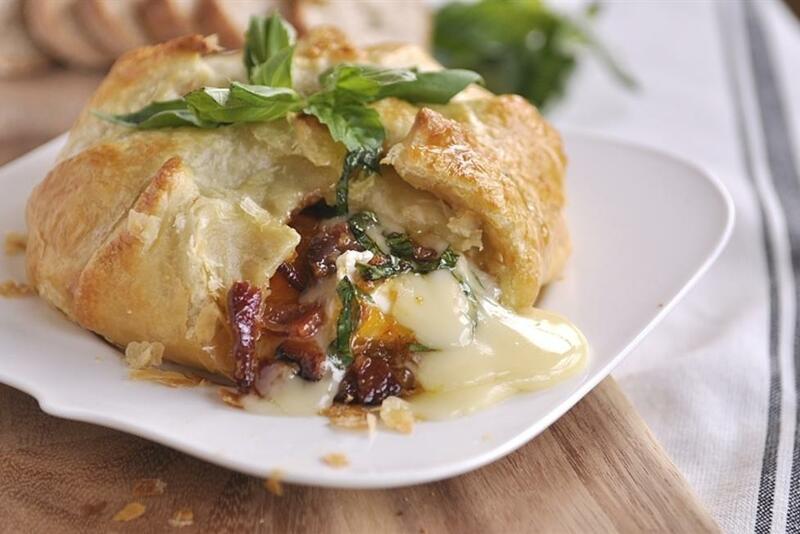 Place your Brie in the middle of the pastry sheet. The brie will be covered with a “rind”. This rind is eatable and can be left on. Place 1/4 cup of peach jam on top. I used my homemade peach jam but store bought will work fine. Then top it with bacon and freshly sliced basil. Then gently wrap the puff pastry around the brie. I make little tucks in the pastry as I work my way around the brie. Be sure and pinch the pastry closed so your filling doesn’t leak out. Then give it an egg wash – just brush a beaten egg over the surface of the pastry to give it a nice shine. I then placed in on a baking sheet and baked it in the oven at 375 for about 20 minutes. You want it to be nice and golden brown. Then all you have to do is add some sliced baguette or crackers and dig in! If it has baked long enough, all that wonderful brie cheese will ooze out when you cut into it.